It wouldd be folly for the West to arm Ukraine, argues Prof Anatol Lieven in this personal viewpoint piece, but it must take a tough diplomatic line. If the latest ceasefire in eastern Ukraine breaks down, then there will be increased pressure on President Barack Obama by hawks in Washington - Democrat as well as Republican - to provide arms to Ukraine, and on European leaders to acquiesce in this. In the view of a range of analysts and former officials on both sides of the Atlantic, this seems a singularly ill-thought out strategy. Lesson from history More importantly, the advocates of arming Ukraine do not appear either to have sufficiently analysed the actual balance of forces on the ground, or to have studied a key lesson from recent history: namely, what happened to Georgia when its government launched an offensive against separatist rebels and their Russian backers in South Ossetia in August 2008. After brief initial gains, the Georgian army was crushed by new Russian forces. This apparently lunatic Georgian move is only comprehensible if President Mikheil Saakashvili believed that the USA would intervene militarily to prevent Georgia's defeat. Of course it did not, nor had any such promise ever been made by the Bush administration. But the Georgians could have been forgiven for not realising that, given that they had received weapons, extravagant political support, and a promise of future Nato membership from Washington. 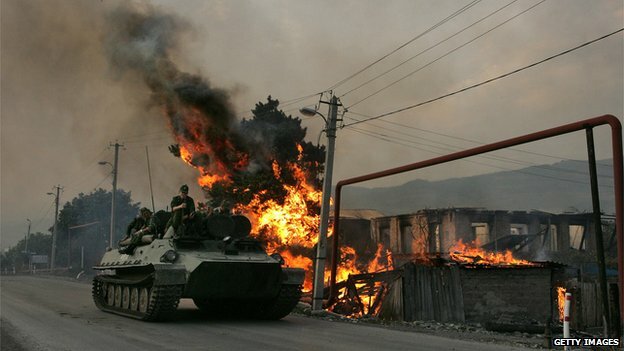 In August 2008, tensions between Georgia and Russia escalated into a full-blown military conflict after Georgia tried to retake South Ossetia by force after a series of lower-level clashes with Russian-backed rebels. Russia launched an overwhelming counter-attack, ejecting Georgian troops from both South Ossetia and Abkhazia, and subsequently recognising the two breakaway regions as independent states. Against the background of this history, it cannot be emphasised too strongly that, for the foreseeable future, however many weapons the Ukrainian army receives from the USA, if it gets into an open fight with the Russian army, it is likely to lose, and lose catastrophically. So far, very limited numbers of lightly disguised Russian troops have been enough to bring to a standstill the entire fighting strength of the Ukrainian army - last autumn, the Nato estimate was that a mere 3,000 Russian soldiers were present in the Donbas. With massive US arms supplies, the Ukrainian army might well be able to launch an initially successful offensive against these forces and their local separatist allies. But what then? All the evidence suggests that the Russian government simply cannot afford the humiliation of a Ukrainian military victory. 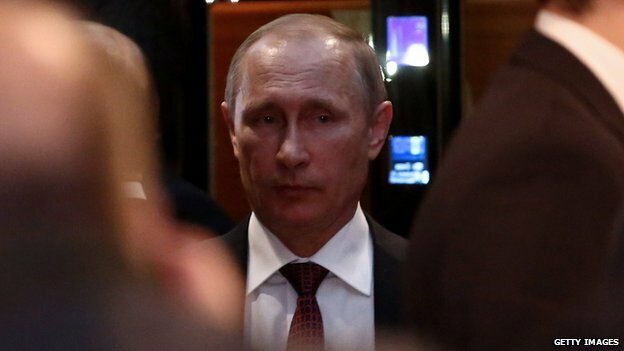 In other words, as in August 2008 in Georgia, Moscow would respond with greatly increased military force. In the highly unlikely event that the USA then sent its own troops to help Ukraine - which has already been repeatedly ruled out - we would be in a European war between nuclear powers. If it did not, the Ukrainian army would risk the high probability of defeat, and if so, the USA and Nato would be severely humiliated. Territory struggle In August 2008, after smashing the Georgian army, Russia briefly occupied parts of Georgia proper - beyond the borders of the separatist territories of South Ossetia and Abkhazia - and then withdrew. Since neither Russia nor the separatists had any historical or ethnic claim on these strategically worthless Georgian territories, there was no reason for them to stay. Russian attitudes to eastern and southern Ukraine are very different. If the Russian army ever marches into Kharkov and Dnipropetrovsk, they are very likely to stay. Ukraine can survive without Donetsk, Lugansk and the Crimea. Indeed, it could be seen as a stronger and more homogenous state without them, as the election of President Petro Poroshenko demonstrated. The loss of a third of the country would be a very different matter. The partition of Ukraine would indeed mark a return to the Cold War, implying vastly increased European military spending, and colossally increased aid to Ukraine intended to prepare the country for early membership of the European Union - something for which the EU is utterly unprepared. The duty of Western leaders therefore is to try to make sure that the present ceasefire works. Despite the battle for Debaltseve, there is some chance that it may work - or at least, a better chance than that of previous attempts. This is above all because it includes a critical element missing from those attempts: a political solution tied to a specific timetable, and one which allows all the main parties to the conflict to achieve their most important goal (with the possible exception of the separatist leadership in the Donbas). Concurrently with the withdrawal of heavy weapons, dialogue is to begin on holding local elections in the rebel territories, in accordance with the Ukrainian law on provisional autonomy for the region. Reopen economic ties The Ukrainian parliament has to pass a resolution on this within 30 days of the ceasefire. By the end of 2015, Ukraine is to regain full control of its borders in the east; but also by the end of 2015, a new Ukrainian federal constitution has to be adopted incorporating special autonomous status for the Donbas. In the meantime, the government in Kiev will reopen economic ties with the Donbas and resume paying official salaries in the region - thereby helping in the process of reintegrating it into Ukraine. For Kiev and Western governments, this agreement secures their most important goal of preserving the sovereignty and territorial integrity of Ukraine, minus Crimea, with a central government which preserves the ability to conduct desperately needed reforms. This is a goal which could otherwise only be achieved through victorious war - and whatever hawks in the USA may think, any full-scale war between Ukraine and Russia will almost certainly result not in Ukrainian victory, but in a crushing Ukrainian defeat and the further dismemberment of the country. Moreover, trying to turn Ukraine into a country capable of planning such a war would require a degree of authoritarian nationalism which would move Ukraine not closer to the European Union, but even further away from it. For Russia, this deal preserves the Donbas as a distinct autonomous area within Ukraine. A federal constitution would also help guarantee the position of Russian-speaking areas of the country against any move to forced ukrainianisation from Kiev. From Moscow's point of view, this would also make it much more difficult to move Ukraine into the West's military camp without a strong consensus behind this in Ukrainian society - a consensus which was present in central European countries during their move to join Nato, but which has never existed in Ukraine. This is the main sticking point as far as hardliners in both Ukraine and the US are concerned: that the present deal will make Ukraine's membership in Nato and the EU impossible. 'Long and painful changes' In actual fact, however, these are non-issues. By repeatedly stating that under no circumstances will Nato troops be sent to defend Ukraine, Nato seems to have rendered the idea of Ukrainian membership an unlikely prospect. As for EU membership, it's unlikely any West European leader has ever considered this as more than the remotest of prospects, decades in the future and dependent on a whole series of extremely long and painful changes. This is a decision therefore which would in all circumstances have to be left to a future generation. Moreover, given the economic reality of Ukrainian economic dependence on Russia, salvaging Ukraine's collapsing economy can only be done in co-operation with Russia, not against her. Unless, that is, the EU is prepared to demand from West European populations enormous sacrifices for the sake of helping Ukraine. Anyone who believes that is likely should have a brief conversation with a Greek. 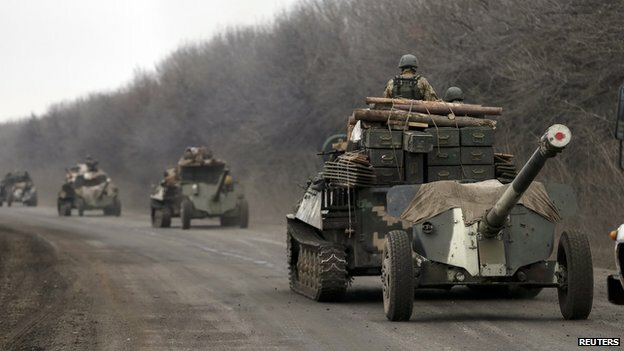 James Reynolds reports from Debaltseve, "a town almost too dangerous to live in"
For the ceasefire to hold and a political solution to be reached, the governments of France and Germany will have to show an unwonted degree of resolve and toughness over the next year. On the one hand, they will have to make clear to Moscow that the relaxations of sanctions against Russia will only come as a result of clear and consistent pressure on the Donbas rebels to abide by the terms of the ceasefire and to pursue autonomy within Ukraine, and not independence. On the other hand, they will need to make clear to the Ukrainian government and to hardliners in Washington that significant EU aid to Ukraine, and an eventual path to possible EU membership, both depend on Kiev honouring the promise of real autonomy for the Donbas. The present ceasefire and the associated political process are not perfect, but they present the best chance so far of ending this conflict, preserving by far the greater part of Ukraine as a unitary state, and avoiding an escalation of the war that would most probably be very bad for Russia and the West, and absolutely disastrous for Ukraine. Anatol Lieven is a professor at Georgetown University in Qatar and author among other books of Ukraine and Russia: A Fraternal Rivalry. this article is inspiring and interesting,keep posting. Ukraine really is a normal country, only maybe with bigger problems that anywhere else. But tourists won't feel the difference from other places in the region.hence it is a very nice article.